yeah. I'm not in the opinion business. There are too many facts that are not known. I have no incentive to speak up for them. I'm not part of them and they would never accept a potty mouth like me. Using current best information, this is how it is. If you look deeply into this clergy abuse, you will see a level of deception that DEFIES description. it literally angers me. Whistleblowing website WikiLeaks today published more than 1.7million U.S. records covering diplomatic or intelligence reports on every country in the world. 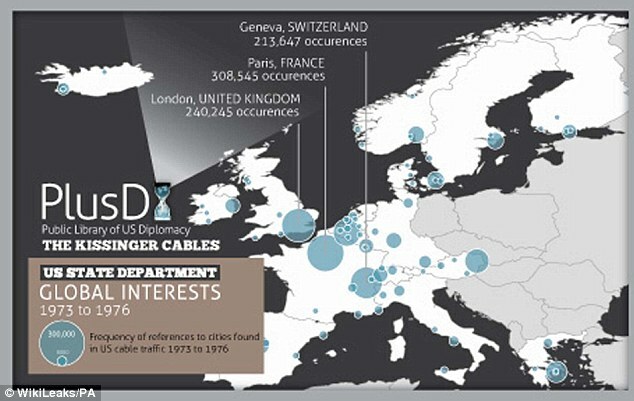 The data released today includes more than 1.7million U.S. diplomatic records from 1973 to 1976 - covering a traffic of cables, intelligence reports and congressional correspondence. WikiLeaks described the Public Library of US Diplomacy (PlusD) as the world's largest searchable collection of U.S. confidential, or formerly confidential, diplomatic communications. Much of the work was carried out by WikiLeaks founder Julian Assange, 41, during his time in the Ecuadorian Embassy in London, where he has been staying since last summer. The Australian sought refuge at the embassy last June over fears that he would be sent to the U.S. if he was extradited to Sweden to face sexual offence claims by two women - charges he denies. Silicon Valley is fighting privacy advocates over a California bill, the first of its kind in the nation, that would require companies like Facebook Inc. FB -1.10%and Google Inc. GOOG -0.75%to disclose to users the personal data they have collected and with whom they have shared it. The industry backlash is against the "Right to Know Act," a bill introduced in February by Bonnie Lowenthal, a Democratic assemblywoman from Long Beach. It would make Internet companies, upon request, share with Californians personal information they have collected—including buying habits, physical location and sexual orientation—and what they have passed on to third parties such as marketing companies, app makers and other companies that collect and sell data. The bill highlights how lawmakers are seeking to update privacy laws. An update of a 10-year-old law focused on the direct-marketing industry, the bill could have national impact because of California's size, and it would bring the state's privacy practices closer to those common in Europe. LOS ANGELES (AP) -- Some people have had it with TV. They've had enough of the 100-plus channel universe. They don't like timing their lives around network show schedules. They're tired of $100-plus monthly bills. It is necessary that arms imports to all sides in the Syrian conflict are halted, Russia’s President Vladimir Putin said in Hannover, adding that Russia is ready to discuss this. “As for Syria we don’t have a solution yet. What do I think should be done? Halt arms import to the country, but to all sides of the conflict,” he said at the annual industrial fair in Hannover. I can't wait to read the Humpty Dumpty cables! I'll be doing a research paper on this. I know numerous families and individuals who have dropped cable while keeping the internet. With rising bill costs, people are starting to ponder whether or not cable tv is worth it. this is smart. You can still do your thing, they just need to know who is the money behind it. I thought Mark Zuckerberg wanted to make the world OPEN AND CONNECTED? i guess it's just a one way thing huh? WASHINGTON (AP) -- President Barack Obama is sending Congress a $3.77 trillion spending blueprint that seeks to achieve an elusive "grand bargain" to tame runaway deficits by raising taxes further on the wealthy and trimming popular benefit programs such as Social Security. The president's proposal being unveiled Wednesday includes an additional $1.8 trillion in deficit reduction over the next decade, bringing total deficit savings to $4.3 trillion, based on the administration's calculations. It projects that the deficit for the 2014 budget year, which begins Oct. 1, would fall to $744 billion. That would be the lowest gap between spending and revenue since 2008. It seem like it was only yesterday that Bitcoin crossed $200 for the first time. Oh wait, it was. It is now 24 hours later, and as parabolic rises imply, it is only "fair" that the price of the electronic currency (expressed in the same currency that incidentally can be created out of thin air and is used to transact for BTC) is some 25% higher, or well over $250.... In one day. As before we will merely continue to watch in quiet amazement as the parabolic chart gets parabolic-er, but we will suggest this: those who absolutely must chase this runaway chart should not "invest" one penny more than they are comfortable losing, and as we said before, "This leaves us with the question, which line item on the Fed's Balance Sheet is 'Virtual Currency Transactions'... what better way to destroy an up and coming currency competitor than to blow a bubble in it and explode it?" The European Commission warned of “excessive” risks to the economic health of Slovenia and Spain, calling on both governments to take urgent action to stem the spread of the euro crisis. Slovenian banks are likely to need fresh capital injections as over-indebted corporate borrowers struggle to pay back loans amid a double-dip recession, the Brussels-based commission said. It said Spain is encumbered by public and private debt. Slovenia’s ailing banks have made it a target for financial markets, with shrinking demand in a debt auction yesterday signaling investor expectations that it will be forced to seek a bailout. Spain is already tapping aid for its banking system. Political gridlock and legal snags “have prevented Slovenia from addressing its imbalances adequately and enhancing its adjustment capacity, thus increasing its vulnerability at a time of heightened sovereign funding stress in Europe,” the commission, which enforces European Union regulations, said in a report today. The Health Insurance Portability and Accountability Act Privacy Rule establishes national standards to protect individuals’ medical records and other personal health information, according to the Department of Health and Human Services. I was able to reconnect for an interview with legendary Quantum Fund manager and commodities bull, Jim Rogers. This was an especially groundbreaking interview, as Jim shared thoughts on what governments around the world will be taking next, and what he’s doing right now to protect his personal bank accounts following the Cyprus collapse. France has withdrawn its first batch of 100 troops out of the 4,000 deployed in Mali as it prepares to hand over operations to a UN peacekeeping force, with 1,000 French troops to remain on the ground by the end of the year. However, fears are mounting that Mali will become a drawn-out war, spilling into other regions and fueling terrorism. France justified its January intervention into Mali as a necessary battle to stem the advance of Al-Qaeda-linked militants who had seized northern Mali, and threatened to gain control over the capital Bamako. Al-Qaeda in Iraq (AQI), an official auxiliary of the parent al-Qaeda organization which was established to resist the US occupation of Iraq, has announced that it is formally merging with Jabhat al-Nusra. Jabhat al-Nusra had been publicly endorsed by al-Qaeda officials repeatedly as the preferred Islamist faction in Syria’s ongoing rebellion. AQI says that the merged group will replace the name Islamic State of Iraq with Islamic State in Iraq and the Levant. “It is time to declare to the Levant and to the world that the al-Nusra Front is simply a branch of the Islamic State of Iraq,” confirmed AQI leader Abu Bakr al-Baghdadi. Baghdadi went on to say other alliances were possible so long as the group agreed to similar harsh definitions of Sharia Law. London British Foreign Secretary William Hague has been outspoken on the need for western intervention in Syria's civil war, recently calling international policy towards the crisis an abject failure. So as the host of Wednesday's G-8 meeting of Foreign Ministers, Hague decided to invite his own special guests to the event: Syrian opposition leaders desperate for international help. They'll be asking for a safe zone in northern Syria, enforced by NATO's patriot missile batteries positioned along the Turkish-Syrian border. This would allow aid to flow into the areas liberated by the rebels that are struggling without food, medicine and other basic services. A request for heavy weaponry will also be on opposition's wish list. Specifically, they plan to ask for the European arms embargo to be lifted, but right now only Britain and France support such a move. Those in favor of lifting the embargo feel it's become counterproductive because the conditions on the ground have changed so dramatically since the embargo was put in place two years ago. The casualty numbers have skyrocketed and the regime enjoys a major weapons advantage thanks to Russian and Iranian support. John Kerry might well be wondering what he has let himself in for. Half way through a ten-day global trip that has immersed him in the Arab-Israeli peace process and Syria’s civil war, on Friday the new US secretary of state flies into the middle of the latest North Korea crisis. Making his first visit to Asia since taking office, Mr Kerry will travel to Seoul, Beijing and Tokyo at the very time North Korea could test its new medium-range ballistic missiles in what is widely believed to be an attempt to force new concessions or aid from the international community. In a trip that will set the tone for the international response to the latest threats from North Korea, Mr Kerry’s objective will be to resist pressure from Pyongyang and provide continued reassurance to the US’ South Korean and Japanese allies, while also cajoling China into putting more pressure on its North Korean ally. There was much hope in the feudal states of Europe that the monthly December drop in Greek unemployment - the first in years - was the beginning of the end for local misery. Alas, it appears the Greek statistics office leaarned a thing or two from the BLS and it was all seasonal adjustments. As reported earlier today, things just got much worse again, with January unemployment surging by 1.5% in one month to a new all time record high 27.2%. More importantly, the number of employed people in Greece, which dropped to a new record low of 3.617,771 compared to 3,888,400 a year ago (and down 11,653 from December), is now nearly as much as the entire inactive population at 3,346,423 and far below the ranks of the unemployed (1,348,694 - an all time high as well) and inactive. Spread by gender, the unemployment rate for males was 23.9%, while a record 31.4% of eligible women had no job in January. Finally, youth unemployment once again hit a record high 59.3% in January, even as unemployment among those aged 65-74 has soared from 0.9% in 2008 to 6.9% in 2013. Claudia Burzichelli doesn’t want to die like her dad. Nine years ago, her father, already afflicted with Parkinson’s, killed himself with a gunshot to the head days after his release from a hospital where he had been treated for a heart attack. Burzichelli, 54, now suffering from kidney and lung cancer, is haunted by her father’s violent death, even more so as she contemplates her own mortality. She hopes to find a more peaceful way to end her life, if it comes to that. Baby boomers, like Burzichelli, a former education manager at Rutgers University, are at the forefront of a new movement. They brought on the sexual revolution, demanded natural childbirth, fought for legalized abortion and turned the mid- life crisis into a force for self-improvement. Now they’re engaged in transforming how Americans experience death. In states across the country, including New Jersey, Connecticut, Massachusetts and Vermont, graying baby boomers have been lobbying lawmakers in recent months at hearings, in letters and by phone, pushing to make it legal for doctors to prescribe life-ending drugs to terminally ill patients. Advocates and opponents say there is more support this year than in past attempts with five states considering such legislation. An assessment by the European Commission says Cyprus must sell about 400m euros (£341m) worth of gold. The country has already been forced to wind down one of its largest banks in order to qualify for a 10bn euro lifeline from international lenders. Even with that bailout, it is predicted that the Cypriot economy will shrink by 8.7% this year. Cyprus's total bullion reserves stood at 13.9 tonnes at the end of February, according to data from the World Gold Council. At current prices, 400m euros' worth of gold amounts to about 10.36 tonnes of metal. If reports of a sale by the Financial Times and news agencies are correct, it would be the biggest bullion sale by a eurozone central bank since France sold 17.4 tonnes in the first half of 2009. The next frontier for the robotics industry is to build machines that think like humans. Scientists have pursued that elusive goal for decades, and they believe they are now just inches away from the finish line. A Pentagon-funded team of researchers has constructed a tiny machine that would allow robots to act independently. Unlike traditional artificial intelligence systems that rely on conventional computer programming, this one “looks and ‘thinks’ like a human brain,” said James K. Gimzewski, professor of chemistry at the University of California, Los Angeles. Gimsewski is a member of the team that has been working under sponsorship of the Defense Advanced Research Projects Agency on a program called “physical intelligence.” This technology could be the secret to making robots that are truly autonomous, Gimzewski said during a conference call hosted by Technolink, a Los Angeles-based industry group. This project does not use standard robot hardware with integrated circuitry, he said. The device that his team constructed is capable, without being programmed like a traditional robot, of performing actions similar to humans, Gimzewski said. Instead, many of the attacks are aimed at suspected low-level tribal militants, who may pose no direct danger to the United States – and for many there appears to be little evidence to justify the assassinations. Top secret documents obtained by McClatchy newspapers in the US show the locations, identities and numbers of those attacked and killed in Pakistan in 2006-8 and 2010-11, as well as explanations for why the targets were picked. In the 12-month period up to 2011, 43 out of 95 drone strikes in the reports (which give an account of the vast majority of US operations in the country) were not aimed at al-Qaeda at all. And 265 out of 482 people killed in those assassinations, were defined internally as “extremists”. Indeed, only six of the men killed – less than two percent – were senior al-Qaeda leaders. NYTimes, April 10, 2013: Some experts say that contaminated water has continued to reach the Pacific. Jota Kanda, an oceanographer at the Tokyo University of Marine Science and Technology, said last month in a discussion paper posted on the Web site of the journal Biogeosciences that Tepco’s own readings of radiation levels in waters off the plant suggest a continued leak of radioactive cesium into the ocean. “This suggests that water might be leaking out from the plant through damaged pipes or drains or other routes,” he said. A controversial cybersecurity bill is one step closer to being added to the law books following a closed-door meeting between members of Congress on Wednesday. Privacy advocates are up in arms after the House Intelligence committee overwhelmingly approved an updated draft of the Cyber Intelligence Sharing and Protection Act, or CISPA, Wednesday afternoon by a vote of 18-to-2. Now if the bill makes it all the way to the desk of US President Barack Obama, Americans will likely be subjected to having the personal information they provide to online businesses shared with the government’s top-secret spy agencies. The authors of the bill, Reps. Mike Rogers (R-Mich.) and Dutch Ruppersberger (D-Md. ), introduced a revamped version of CISPA in February after attempts to pass the act in 2012 were thwarted when the congressional session came to a close before a final vote could occur. In the few months between the original CISPA’s demise and the reintroduction, though, officials have reported an increase in cyberattacks by way of Iran and China that have been condemned by politicians as high up as the president. “Congress must act,” Obama said during his 2013 State of the Union address, “…by passing legislation to give our government a greater capacity to secure our networks and deter attacks.” On their part, Rogers and Ruppersberger say CIPA will “provide for the sharing of certain cyber threat intelligence and cyber threat information between the intelligence community and cybersecurity entities,” by closely monitoring threats to the nation’s cyber infrastructure and formally legalizing the practice of sending personal user data to government agencies, including the Department of Defense and the National Security Agency. It is wrong that I find #3 to be one of the funniest articles posted in this thread? Greece is melting down. Wow. they've been conned by the banksters so badly. If you are terminally ill and want to die.. and you are conscious and rational, I don't see a problem with doctor assisted suicide. Twenty million Americans consider themselves lapsed Catholics, but Pope Francis is convincing many to test the holy waters again with his bold gestures and common touch. After years of disenchantment with the church's hierarchy and teachings, former members of the flock say they are willing to give the Vatican a second chance under new leadership. Dallas teacher Marilyn Rosa is one of them. "He's being studied very closely," Cardinal Edward Egan of the Archdiocese of New York said of Pope Francis, added that wherever he goes, priests want to know how the Pope will change the Catholic Church and what the implications will be. Cardinal Edward Egan is interviewed by TODAY's Lester Holt. "It was a sign," Rosa, 57, said of the Argentine Jesuit's election as pontiff last month. "It was like a miracle." JPMorgan Chase saw its net income rise 33 per cent to $6.5bn in the first quarter as the largest US bank by assets produced steady revenues while cutting expenses. The results – the first in Wall Street’s earnings season – beat analysts’ expectations of about $5.4bn in net income. Retail banking, powered partly by mortgage originations, and corporate and investment banking, driven by debt issuance, contributed to what Jamie Dimon, chief executive, called “a very good start to the year”. However, he warned that although there were signs that the US economy was “healthy and getting stronger”, “loan growth across the industry has been softer this quarter”. The bumper profits banks including JPMorgan have enjoyed on mortgages, a controversial side effect of Federal Reserve policy, appear to be on the wane. JPMorgan noted “lower margins and higher expenses” from mortgage production, crimping income. The Fed is buying billions of dollars of mortgage-backed securities in an attempt to loosen credit in quantitative easing known as QE3. Until recently, this was providing a record margin between the price banks wrote mortgages at and the price they sold them on. Fiercer competition now appears to have eroded the margin. (Reuters) - The United States said on Saturday that China had agreed to help rid North Korea of its nuclear capability by peaceful means, but Beijing made no specific commitment in public to pressure its long-time ally to change its ways. U.S. Secretary of State John Kerry met China's top leaders in a bid to persuade them to push reclusive North Korea, whose main diplomatic supporter is Beijing, to scale back its belligerence and, eventually, return to nuclear talks. Visiting Beijing for the first time as secretary of state, Kerry has made no secret of his desire to see China take a more active stance towards North Korea, which in recent weeks has threatened nuclear war against the United States and South Korea. Kerry and China's top diplomat, State Councillor Yang Jiechi, said both countries supported the goal of denuclearizing the Korean peninsula. "We are able, the United States and China, to underscore our joint commitment to the denuclearization of the Korean peninsula in a peaceful manner," Kerry told reporters, sitting next to Yang at a state guesthouse in western Beijing. The yuan reached a record high yesterday as the central bank fixed its midpoint against the US dollar at the strongest level ever. That sparked anticipation of further appreciation this year and stoked inflationary pressure on the mainland and Hong Kong. The People's Bank of China set the midpoint at 6.2506 yuan per US dollar - up from the fixing of 6.2578 on Thursday - ahead of a visit by US Secretary of State John Kerry to Asia. The yuan jumped to 79.775 Hong Kong dollars per 100 yuan, just near the record of 79.729 on Wednesday. China often allows the yuan to appreciate faster before visits by officials from Western countries, who usually push for exchange rate liberalisation. However, the yuan is set to strengthen this year. Inflows of capital are expected to generate higher demand for the yuan than last year as the mainland economy recovers, economists said. "In 2013 we'll see greater risks of capital inflows to China, rather than two-way movements in the yuan exchange rate or capital outflows as last year," said Chang Jian, an economist at Barclays Capital. Barclays expects the yuan to strengthen 2 per cent against the greenback this year, after considering China's intention to protect exporters in the still shaky economic recovery. NEW YORK — IRS documents released Wednesday suggest that the tax collection agency believes it can read American citizens’ emails without a warrant. The files were released to the American Civil Liberties Union under a Freedom of Information Act request. The organization is working to determine just how broadly federal law enforcement agencies like the FBI or the IRS’ Criminal Tax Division interpret their authority to snoop through inboxes. In 1986 they decided this? Who used email in 1986? That’s why an internal 2009 IRS document claimed that “the government may obtain the contents of electronic communication that has been in storage for more than 180 days” without a warrant. JPM is a stronger bank than Goldman.. even though Goldman appears to be more influential. WASHINGTON (AP) -- Foreign demand for U.S. Treasury securities rose to a record level in February, indicating that international investors remain confident in U.S. debt despite budget wrangling in Washington. The Treasury Department said Monday that foreign holdings of U.S. Treasury securities increased 0.3 percent in February from January to a record $5.66 trillion. It was the 14th straight monthly increase. China, the top foreign owner of Treasury debt, increased its holdings 0.7 percent to $1.22 trillion. Japan, the second-larger holder, trimmed its holdings 0.6 percent to $1.1 trillion. Overall demand kept rising despite sharp disagreements between Congress and President Barack Obama over tax and spending issues. Still, Congress approved a measure to temporarily suspend the borrowing limit until May 19. That has allowed the government to take on more debt while the debate continues. The 50-year-old former bus driver, whom Chavez named as his preferred heir before dying from cancer, edged out opposition challenger Henrique Capriles with 50.7 percent of the votes in Sunday's election, according to election board returns. Capriles took 49.1 percent, just 235,000 fewer ballots. The Jordanian government has reportedly agreed to be in charge of the huge Saudi Arabia-funded push to arm Syrian rebels, a move that inserts the nation into an even more direct role in the rebellion. Jordan already hosts a major US military training effort for the rebel Free Syrian Army (FSA), and is hoping to parlay its existing ties with the rebel movement into more direct influence on where the weapons go. The Hashemite Kingdom seems to be resigned to having no ties with the Assad government, but is said to view the growing prospect of an al-Qaeda-backed Islamist regime in Syria as an even bigger threat, and is hoping to prop up more “moderate” portions of the rebellion. In the end though, those moderates are still fighting arm in arm with the Jabhat al-Nusra and others, and it remains to be seen if arming one group but not the other will really keep arms from getting spread around. Meanwhile, Britain is looking to up its own “aid” in rebel held portions of northern Syria. That’s been a problem in the past, with rebels stealing much of the aid, but the British government is looking to eliminate the middle man by sending all the aid to the rebels directly. (Reuters) - Gold headed for its biggest two-day drop in 30 years on Monday as funds accelerated their exits from the market, and investors also cut exposure to oil, copper and grain after underwhelming Chinese growth data. The precious metal slid further into bear territory, dropping more than $30 in a matter of minutes at one point. Losses widened to more than 6 percent at the lows as prices breached support at $1,400 per ounce after falling 5.3 percent on Friday. Oil fared scarcely better, dropping by as much as nearly 3 percent. Other precious metals were caught in the downdraft, with silver briefly dropping 10 percent, and industrial metals plummeted, with copper hitting its lowest in over a year. In the grains market, wheat, corn and soybeans fell. Afghanistan is heading for a near-record opium crop, according to a report by the UN’s Afghanistan Opium Winter Risk Assessment. “Poppy cultivation is not only expected to expand in areas where it already existed in 2012, but also in new areas or areas where poppy cultivation was stopped,” the report said. Poppy cultivation is greatest in the Taliban-controlled southern heartlands, in regions where troops in the US-led coalition have either withdrawn are in the process of pulling out, and in areas where there is poor security and little in the way of agricultural aid. Of Afghanistan’s 34 provinces only 14 were expected to remain poppy free, with an increase predicted in 12 and no major change in 7. The western Herat province showed a fall in cultivation, although this is believed to be due to a statistics blip. If there is no disruption to this year’s poppy harvest, Afghanistan will regain its position as producer of 90% of the world’s opium. Is GMO corn nutritionally equivalent to non-GMO corn? Monsanto will tell you the answer is a big ‘yes’, but the real answer is absolutely not. And the simple reality is that they are continuing to get away with their blatant misinformation. In fact, a 2012 nutritional analysis of genetically modified corn found that not only is GM corn lacking in vitamins and nutrients when compared to non-GM corn, but the genetic creation also poses numerous health risks due to extreme toxicity. With the recent passing of the Monsanto Protection Act, there is no question that mega corporations like Monsanto are able to wield enough power to even surpass that of the United States government. The new legislation provides Monsanto with a legal safeguard against federal courts striking down any pending review of dangerous GM crops. It is ironic to see the passing of such a bill in the face of continuous releases of GMO dangers. Non-GMO Corn 20x Richer in Nutrition than GMO Corn. The 2012 report, entitled 2012 Nutritional Analysis: Comparison of GMO Corn versus Non-GMO Corn, found numerous concerning and notable differences between GMO and non-GMO corn, none of which are particularly surprising. First, the report found that non-GMO corn has considerably more calcium, magnesium, manganese, potassium, iron, and zinc. The Department of Homeland Security is collaborating with New York State government officials to confiscate guns belonging to people who are deemed, often erroneously, to have a mental condition, according to radio host Tom Bauerle. “NY State Talk Radio Host Tom Bauerle discussed on his program that several sources inside NY State Govt have told him that the Dept of Homeland Security played an active role in meeting and collaborating with NY State Officials to develop and implement the confiscation scheme that targeted David Lewis and an as yet unknown number of others,” reports Ammoland.com. Back in March it also emerged that the DHS was working with the Department of Revenue to collect information on gun owners in Missouri. The fact that the DHS is coordinating with state government officials on gun confiscations is particularly unnerving given recent developments. As we reported last week, the federal agency is testing a number of different drones at a scientific research facility in Oklahoma that have sensors capable of detecting whether a person is armed, stoking concerns that the federal agency is planning on using UAVs to harass gun owners. Under the NY SAFE Act, anyone considered as having a mental condition can have their firearms seized by police and their Second Amendment rights suspended. The law encourages therapists, doctors, nurses and social workers to report patients they determine may engage in conduct that may result in harm to self or others. “You won’t do what I want when it comes to stopping Israeli settlements, and I can’t do what you want in terms of dismissing Palestine. Now, pretend to laugh at what I just said so it appears like we get along.” As Obama walked up the tarmac with his arm around Netanyahu’s shoulder, the President said he basically traveled 5,000 miles for a meaningless photo op, at which point both men turned around, waved one last time, and stepped into a waiting limousine. ^ hahaha. did you post an onion article on purpose?